Chateau Ste. Michelle is celebrating its 50th anniversary this month—a major milestone for Washington wine. “In the timeline of major American brands, that’s pretty remarkable,” says president and CEO Ted Baseler. According to Impact Databank, Chateau Ste. Michelle ($9 a 750-ml. to $200 a 375-ml.) is the largest non-California domestic table wine brand, the No.-2 super-premium brand by dollar sales, and the only non-California brand in the top five by value. Shipments grew by 5 percent last year to 3.4 million cases, bolstered by premiumization. “We’re having success with Chateau Ste. Michelle’s Indian Wells tier, which is more premium than the Columbia Valley line,” Baseler says. Chardonnay and Riesling drive the highest volume, with Washington Cabernet Sauvignon an increasing focus. “We’re seeing high levels of interest in Washington Cabernet, as well as great interest in Syrah and Rhône-style wines,” Baseler says. Consumers over age 45 are Chateau Ste. Michelle’s core demographic, but Baseler adds that millennials are becoming more important. Marketing initiatives like the 10 Perfect Sips digital campaign emphasize the quality of the brand and Washington wine. In honor of its 50th anniversary, the company is expanding its Woodinville chateau with a movie theater and new blending rooms for visitors. In addition, Chateau Ste. 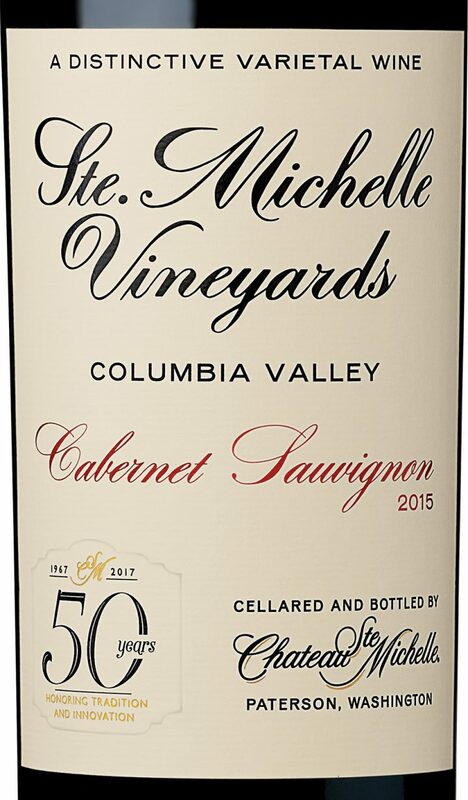 Michelle is launching a 50th Anniversary Columbia Valley Cabernet Sauvignon ($15 a 750-ml; $50 a 1.5-liter), featuring the original packaging from the 1967 vintage.